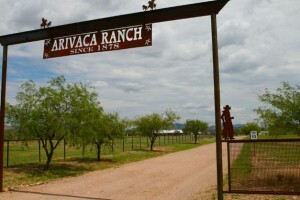 The Arivaca Boys Ranch serves boys, age 14 to 18, on a 23,000 acre, 140-year-old ranch. The ranch is designed to therapeutically help troubled boys. The Arivaca Boys Ranch is a year-round therapeutic boarding school helping 50 at-risk boys, age 14 to 18, on a ~10,000 acre, 140-year-old cattle ranch in Arizona. The ranch is specifically designed to therapeutically help teenage boys learn how to make better decisions and become more mature in their thinking, while learning life skills right along with the “book learning” they’ll receive in our accredited on-campus school. Arivaca Boys Ranch is unique in that it uses three powerful therapeutic tools to help teen boys get on a right path in life. First, a specialized form of equine therapy. Equine therapy is commonly used to help teens who are struggling, but we take it one step further, we teach the boys to become “horse whisperers.” Known as the “Arivaca Way,” our therapeutic model teaches boys to understand how their behavior or mood affects their horse, and that helps them become more aware and responsible of their actions and how they affect others. Secondly, we use Arbinger Principles to help provide a foundation for moving behavior from anger to positive motivational action. The principles were developed by the Arbinger Institute, which is a worldwide leader in training on anger management. And third, we use the working ranch setting for training, responsibility and positive peer influence as a means of helping the teen grow in maturity. The Arivaca Boys Ranch serves 30-35 troubled teen boys (13 to 17 years of age) each year. Using horses as a therapeutic tool, each boy has the opportunity to experience the rewards of hard work and ranch life while continuing his High School education. As each teen boy progresses through five levels, he becomes familiar with “Natural Horsemanship.” Combined with personal and group counseling services, Natural Horsemanship techniques help each young man learn about himself and how to cope productively within society. Boys live in bunkhouses in groups of five or ten. They attend High School classes to further their education while living at the teen boys ranch. A “Wrangler” is assigned to each group of five. This Wrangler will live with the boys and guide them through the boys ranch program. Each young man also receives weekly counseling. The boys ranch program lasts approximately 10 months. Level One: Boys enter Ranch Life. Each day consists of chores and ranch work. Boys receive counseling to help them adjust and to help them learn the value of correct choices (consequences). “Positive Experiences” are the basis of counseling and daily activities, teaching a young man to better his environment and opportunities with positive choices. Level Two: Boys enter the world of horses. Although they have little or no experience with horses they learn to respect and care for horses. Through positive and safe introductions to horses they overcome fears and develop the skills necessary to care for and ride a horse. They learn the psychology of a horse as a social (herd) animal and how to convert that knowledge to their own social interactions. Boys continue to have responsibilities with the daily ranch operations. At level two boys are part of a team (5 boys) led by a Wrangler. This team participates in activities such as daily ranch chores, laundry, cooking and cleaning, as well as school classes. Each week, boys are paid for their ranch work with “Ranch Dollars” that can be used to buy privileges (like watching videos) or items at our “General Ranch Store.” Boys receive bonuses for working together and promoting each other as a team. Through this each boy learns fiscal responsibility, how to budget, and how to work together. Level Three: Boys receive a two- to three-year-old horse to train. Working with our trainers and wranglers, boys learn patience, sensitivity, and how a horse “mirrors” their emotions. Most or all of their work with horses is “ground work” (not on horseback). Through these activities, boys experience success, failure, overcoming adversity, communication skills, and positive personal growth. Level Four: Boys begin advanced horse training and riding their horse. They help mentor younger level one and two boys. They also participate in “imprinting” new foals, the selection and breeding process of Arabian horses, and are introduced to cattle work. They are given leadership responsibilities. Level Five: Boys at this level are experienced on horseback and have shown responsibility. They can now participate in activities away from ranch headquarters. (i.e., roundups, horse shows, community and ranch sponsored events). Level Five boys also serve in a judicial system used on the ranch for boys to settle disputes. Level Five boys serve as mentors to Level One Boys who are trying to adjust to “Ranch” life. They also have opportunities to interact with Arizona businessmen and educators who can, in turn, serve as mentors for their adjustment back into society. On all levels boys are responsible for laundry, cooking and cleaning chores, personal hygiene, and spiritual development. Each boy works closely with a “Wrangler,” who serves as a guide and counselor on daily activities. Boys also have one hour of professional counseling each week, along with one hour of group counseling. Each young man receives one session a week with a trained therapist. This therapist is trained to incorporate the daily experiences of the program into the young man’s life. He helps the young man make the connection between “Equine Therapy” and real life. Each week every young man joins with his “family” group for a session led by a counselor. This provides a chance to develop communication skills, cooperation, relationships, empathy and understanding, and develop anger management skills, etc. Each young man is in a family group with five other boys. This group is led by a trained Wrangler (staff member). Each staff member has been trained in “Arbinger Principles” and helps the young man understand these principles in his life. Every evening includes a reflection session to review the events of the day, write in a journal, and resolve any conflicts within the group. A powerful therapy known as “Equine Therapy” is becoming very popular. There are many ways in which horses are used to help people, from handicapped children to hardened criminals. Our Equine Therapy is much more than a “petting zoo.” Although there is value in caring for another living creature, our program is based on a personal working relationship between a young man and his own horse (each young man is assigned a young horse that only he works with.) Because of a horse’s instinct to survive and interact socially he is very sensitive to his environment and becomes a mirror of the young man’s emotions and feelings. Through exercises in natural horsemanship, each young man must learn to communicate on the horses level and develop a trusting relationship that allows him to lead the horse without force or coercion. Through this process, the teen boy learns more about himself and his personal relationships with others than he does about horsemanship. If your son is struggling, consider Arivaca Boys Ranch for helping him find his way back to right thinking and to a renewed relationship with you. We have a full academic program, 24/7 care, as well as our unique and effective 3-tiered therapy. The Arivaca ranch is at a higher elevation, with a climate similar to inland San Diego, California.